Thanks to the tire-smoking efforts of Jerry Bruckheimer, Nicholas Cage and several stunt drivers, the GT500 name was slapped silly with a renewed sense of passion a few years back. Born in 1967, the Shelby GT500 has always been about large displacement muscle replete with a raw, guttural soundtrack to match. Built in cooperation with Shelby, who currently makes 120-150 Cobras a year in addition to a staggering 9,000 Mustangs, the 2008 Ford Shelby GT500 is a no-nonsense powerhouse that takes the spirit of it’s namesake and pairs it with modern technology – that is, ignoring the solid rear axle. The result is a modern piece of American muscle begging you to smoke the tires at every stoplight, slide the tail out of corners and break the speed limit every time the opportunity is presented. The GT500 is a heavy car, weighing in at nearly two tons, and as a result can be somewhat unwieldy in the corners. Low-grade interior doesn’t match the high-end price tag. 500 horsepower means serious speed, and the GT500 hits hard off the line straight up to its 155 mph speed limiter. The supercharged V-8 sees the GT500 to 60 mph in 4.5 brief seconds and through the quarter mile in 12.8 seconds. All that power is put down via a somewhat antiquated solid rear axle, though it doesn’t result in too rough of a ride except on the most patchy and torn apart roads. Weighing in at 3,900 lbs, the GT500 can be somewhat of a handful in the corners and there is a minor delay between your steering inputs and the car’s reaction; it’s nothing major, but it’s certainly there. The less-than-perfect weight balance – 58 percent front and 42 percent rear – somehow doesn’t manifest itself as an issue during spirited driving. The GT500 is powered by a monstrous Ford SVT-engineered 5.4-liter supercharged V-8. The engine makes 500 hp and 480 lb-ft of torque. Power is transmitted through the rear wheels via a heavily weighted six-speed manual gearbox. The clutch is somewhat springy and bites towards the top, but it’s easy to modulate once you are dialed into its behavior. In light of its focus on performance, the GT500 doesn’t have too many options. Luckily, navigation hasn’t been overlooked, and a DVD-based system is available at a $1,995 premium. An upgraded Shaker Audio system can also be added for $1,295, though we can’t see why you’d want to rob your ears of the GT500’s exhaust note by cranking up the tunes. New for 2008 is an Ambient Interior Lighting option priced at $295, which shuffles seven different colors which the driver can choose to light the console, cupholders and footwells. It probably doesn’t need to be said that the star of the GT500 show is the engine. While it isn’t as expensive as that of the Ford GT supercar – the GT500’s engine uses a wet oil sump and is constructed of cast iron versus the GT’s dry sump and aluminum block setup – the output is nearly the same thanks to lessons learned during the supercar’s development. The anti-lock brakes do a good job of dealing with the GT500’s mass, using 4-piston calipers with 14-inch rotors in the front and 11.8-inch rotors in the back. For a car that’s all about muscle, you probably aren’t expecting stellar mileage. Surprisingly, the GT500’s fuel economy isn’t as bad as one might guess, managing 14 mpg in the city and a nice, round 20 mpg on the highway thanks to a long sixth gear. The GT500 distinguishes itself from standard Mustangs with a large, three-spoke steering wheel complete with requisite cobra logo and black sports seats with optional crimson red colored insets. Unfortunately, the interior plastics don’t quite match the GT500’s price tag and, while we agree the interior might not be the focus of the car’s appeal, upgraded components would be welcome. The aggressive front fascia of the GT500, coupled with its bulging hood and racing stripes signal that this car is purely about performance. Standard 18-inch aluminum wheels fill the arches, giving the Mustang an aggressive stance from any angle. 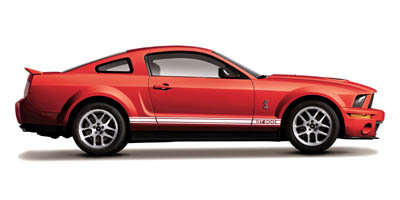 With an MSRP of $42,330, the Ford Shelby GT500 is one of the best horsepower per dollar deals around. Its closest competitors are the $5,000 cheaper (albeit heavier and less powerful) Dodge Challenger SRT8 and the $46,950 Chevrolet Corvette, both of which have massive V-8s and similar build quality. In pure cheap horsepower terms, the Ford Shelby GT500 is hard to look past. While it may be heavy and the steering lacks precision, neither are enough to significantly spoil the driving experience. With the muscle car revival now in full swing, Ford and Shelby are poised to give the competition a run for their money. The more things change, the more things stay the same.